Remove head and tail of fish. Cut fish head into half. Fillet the centre part. Cut into thick strips. Marinate in marinade for 10 minutes. Mix batter well. 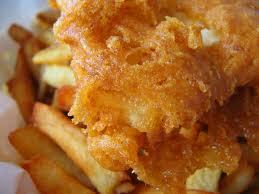 Dip head and tail of fish in batter. Deep-fry till crispy and arrange on plate. Dip marinated fish fillet strips in batter. Deep-fry till crispy and golden arrange in centre of plate to form the shape of fish.